Having mentioned that I was listening to an oldies radio station, I now feel compelled to justify my actions: the radio station plays Buddy Greco. Buddy is the swingingest lounge singer around, in the archetypal Vegas style (although his last gig appears to have been in Palm Springs, according to his website.) It’s impossible to imagine him singing anything without a swagger: I suspect even “Strange Fruit” would yield to his persuasive powers. If there is an LP I truly covet, it is this record that a friend found for $1 in an op shop in Marysville, Victoria. That’s not someone’s scribble over the title, it’s part of the design: the word ‘sun’ is crossed out and ‘love’ written above it – see what they did there? 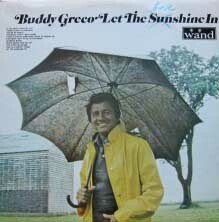 My friend’s copy is a reissue on the Australian cheapo Summit label, which may explain why the cover photo came out so dark – all you can make out of Buddy’s face are his teeth gleaming from the gloom of his comically holey umbrella. 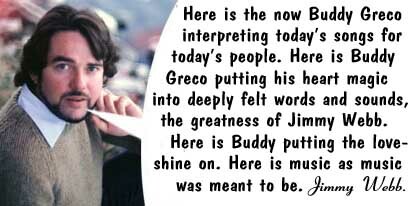 As a Buddy Greco fan page succinctly describes it, “Buddy singing the songs of 1969 ultra hip, with very clever arrangements and a very good backing. The theme ‘Let the sunshine in’ repeats between each song through the whole album.” Indeed, he starts with a blazing version of the Hair hit, and the band quietly jams on the tune to segue from one track to the next, before closing the album with a mournful, haunting reprise. Genius. Yes, Jimmy’s comfortable enough with his genius to assert his own greatness while he’s supposed to be praising someone else. The absolute pinnacle of this album is when Buddy tackles the song that no other ageing crooner dared to touch when the older generation attempted to prove they were still ‘with it’ in the 1960s. Amongst the Jimmy Webb and Burt Bacharach he fearlessly launches head and heart-magic first into the Greatest Song of All Time, the Everest of the 60s counterculture that forever rendered his generation of singers irrelevant. Even more remarkably, he doesn’t reduce it to more manageable proportions: it’s even longer than the already-epic original, adding some much-needed showbiz pizazz missing from it’s better-known incarnation. You will wonder how you could ever bear to hear this song without horn section, backing singers, and a sax solo. It’s 6 Meg, six and a half minutes of unadulterated ecstacy. Download the apotheosis of Buddy Greco for a christmas you will never forget. Now I just have to find the recording of Buddy doing “Macarthur Park”. « News Flash! I am old.